Will 5G make Fixed Wireless Access come of age? - Mentor Europe - triggered by 5G. Unlocking capability through a bold 5G rollout could make this a very attractive investment proposition. But let’s unpick this a little. We’re not talking about point-to-point wireless services, where relatively expensive point to point line-of-sight systems are installed - instead of high-speed fibre circuits. Now we are talking about a more widespread FWA service, where a set of base stations serves a number of homes and businesses in a geographical area - and provides a permanent and credible scale alternative to copper or fibre fixed access technologies. FWA has frequently been promoted as a ground-breaking technology that permanently cuts the fixed access cord for everyone. So why have we been doubtful about widespread deployment of FWA for the mass market? Spectrum – the best spectrum, sub 3Ghz, makes sure that would-be customers get decent coverage when served by a base station with good non-line-of-sight performance (NLOS). NLOS means it goes around corners and provides some resistance to the negative effects of temporary irritations - like rain and leaves. The problem is this spectrum is cherished by the mobile operators, who turn out much higher valuations than fixed wireless operators – and higher auction prices. Capacity – unlike fixed access technologies, wireless access shares the final link to the customer. These radio resources are shared - and contended for - by the customers using them. In fixed solutions, the capacity of each connection is pretty much independent - and new connections are added without impacting existing services. By contrast, a fixed wireless network can just run out of radio capacity and no amount of new fibre to the base station will fix it. Economics – if an operator had enough suitable spectrum - and deep pockets to build enough base stations - all that remains is to find the ‘sweet spot’ where there are plenty of winnable customers in a geography to make a profit. But not so many customers as to gobble up all the capacity. It’s quite a balancing act. Mobile First - the companies best placed to attack this market may be the mobile operators. They have spectrum and extensive base station portfolios with fibre backhaul. They also have lots of existing customers and the capabilities to market new services to them. But does that make business sense for them? According to Ofcom, the average family consumes 190 GB/month on a typically unlimited broadband deal. Keeping the maths easy, let’s call it 200GB per month for £20. (£25 less £5 for voice.) Whereas, unlimited Mobile deals are rare, a more typical heavy user might pay £20 per month for 20GB. That’s £1 per GB for mobile data and 10p per GB for fixed; 10 to 1 difference in price. So, given the capacity crunch Mobile operators face, why on earth would you enter a market where the price per Gigabyte is one tenth of what you can get in your primary market? How will FWA help 5G? The “blogosphere” is on fire just now with the latest set of scoops about fixed wireless access and how 5G is going to make it a big success. Let’s look at what’s involved in reversing the head winds that fuel uncertainty about mass market fixed wireless access. Spectrum – no surprises here. 5G does require a big step-up in the number of base stations in any given area to deliver the massive capacity uplift it promises. As soon as they’re built, these base stations will serve users over shorter, more direct paths and bring cheaper, higher frequency spectrum - even millimetre wave - into scope. 5G spectrum is obviously treasured by mobile operators - but moving into millimetre bands provides game-changing levels of new capacity. Of course, all this capacity needs dark fibre backhaul – but that’s a story we’ve talked about many times before. Capacity – the high frequency spectrum lets us build base stations with multi gigabit capacity. It’s still contended but there is so much more to go around - and the serving area is a great deal smaller. What’s more, innovations in radio performance coming with 4G and 5G help to guarantee that fixed and mobile users get the best available service - even from multiple base stations. Economics – just like capacity, the economic ‘sweet spot’ is still there, but it’s much more comfortable to sit on. And assuming 5G is built in the priority areas first, there’ll be more capacity to sell in each area - and more customers. Mobile First – the price of mobile and fixed data will gradually come together - making fixed traffic less off-putting to mobile companies over time. What makes FWA business attractive to mobile operators is the opportunity to win new customers, increasing ARPU and reducing churn - while leveraging their big 5G infrastructure investments, at marginal cost. It’s a very useful add-on service, provided it doesn’t distort the 5G rollout or impact the mobile service. Verizon’s 5G Home initiative illustrates this perfectly. We suspect they are now picking up new fixed customers in markets where they don’t have fibre infrastructure of their own. Verizon’s model also highlights another point - skills. Fixed is different to mobile - truck rolls, home installation and support are very difficult processes to manage well - and they are poles apart from mailing out SIMs or activating mobile customers in high street stores. So, yes, we’re quite excited about the prospects of FWA ‘escaping’ from niche use and coming of age. A bold 5G rollout could make this a very attractive investment proposition. But we need to get our skates on and build 5G, don’t we? We need to kick-start densification work, build new small cells, acquire dark fibre, master SDN/NFV technology - and dust off our fixed line service skills. This would help to put together a credible fixed service, ‘sliced’ from the host mobile infrastructure. And to do it without bankrupting it. The 5G race won’t be won by the owners of the best technology - or by those with most base stations - or even by whoever gets to market first. It will be won by the MNO that organises itself to tame unparalleled 5G complexity - and successfully executing the program portfolio required to deliver it. All the MNOs are dealing with dizzying levels of network change today. There’s no breathing space on the horizon. The pressure is relentless. If you think 5G network deployment is complex, FWA just makes it a whole lot tougher. What do you think? Get in touch and let us know! Mentor Europe > Blogs > 5G > Will 5G make Fixed Wireless Access come of age? FWA – a new alternative to fibre? We’ve always thought of Fixed Wireless Access (FWA) as a niche – or even ultra-niche technology. It has a role in fringe areas – where homes or businesses can’t get “proper” access for some reason. But if that reason goes away or gets settled, then FWA will be dumped and a “proper” solution put in as fast as possible. This particular technology has kept within touching distance of fibre-based alternatives when compared to Openreach – at least in terms of price per megabit – and where access is difficult or requires a new dig. The approach played a big role in early mobile network construction – and will continue to play a role in the future. Now, we’re quite excited about the prospects of FWA ‘escaping’ from niche use and coming of age for a mass market – triggered by 5G. Unlocking capability through a bold 5G rollout could make this a very attractive investment proposition. We’re not talking about point-to-point wireless services, where relatively expensive point to point line-of-sight systems are installed – instead of high-speed fibre circuits. Now we are talking about a more widespread FWA service, where a set of base stations serves a number of homes and businesses in a geographical area – and provides a permanent and credible scale alternative to copper or fibre fixed access technologies. Spectrum – the best spectrum, sub 3Ghz, makes sure that would-be customers get decent coverage when served by a base station with good non-line-of-sight performance (NLOS). NLOS means it goes around corners and provides some resistance to the negative effects of temporary irritations – like rain and leaves. Capacity – unlike fixed access technologies, wireless access shares the final link to the customer. These radio resources are shared – and contended for – by the customers using them. In fixed solutions, the capacity of each connection is pretty much independent – and new connections are added without impacting existing services. Economics – if an operator had enough suitable spectrum – and deep pockets to build enough base stations – all that remains is to find the ‘sweet spot’ where there are plenty of winnable customers in a geography to make a profit. But not so many customers as to gobble up all the capacity. It’s quite a balancing act. Mobile First – the companies best placed to attack this market may be the mobile operators. They have spectrum and extensive base station portfolios with fibre backhaul. They also have lots of existing customers and the capabilities to market new services to them. Spectrum – no surprises here. 5G does require a big step-up in the number of base stations in any given area to deliver the massive capacity uplift it promises. As soon as they’re built, these base stations will serve users over shorter, more direct paths and bring cheaper, higher frequency spectrum – even millimetre wave – into scope. 5G spectrum is obviously treasured by mobile operators – but moving into millimetre bands provides game-changing levels of new capacity. Capacity – the high frequency spectrum lets us build base stations with multi gigabit capacity. It’s still contended but there is so much more to go around – and the serving area is a great deal smaller. What’s more, innovations in radio performance coming with 4G and 5G help to guarantee that fixed and mobile users get the best available service – even from multiple base stations. Economics – just like capacity, the economic ‘sweet spot’ is still there, but it’s much more comfortable to sit on. And assuming 5G is built in the priority areas first, there’ll be more capacity to sell in each area – and more customers. Mobile First – the price of mobile and fixed data will gradually come together – making fixed traffic less off-putting to mobile companies over time. What makes FWA business attractive to mobile operators is the opportunity to win new customers, increasing ARPU and reducing churn – while leveraging their big 5G infrastructure investments, at marginal cost. It’s a very useful add-on service, provided it doesn’t distort the 5G rollout or impact the mobile service. Verizon’s model also highlights another point – skills. Fixed is different to mobile – truck rolls, home installation and support are very difficult processes to manage well – and they are poles apart from mailing out SIMs or activating mobile customers in high street stores. But we need to get our skates on and build 5G, don’t we? We need to kick-start densification work, build new small cells, acquire dark fibre, master SDN/NFV technology – and dust off our fixed line service skills. The 5G race won’t be won by the owners of the best technology – or by those with most base stations – or even by whoever gets to market first. 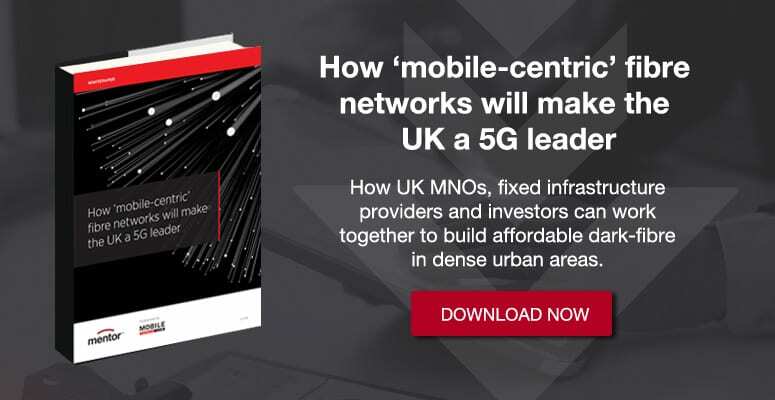 It will be won by the MNO that organises itself to tame unparalleled 5G complexity – and successfully executing the program portfolio required to deliver it. All the MNOs are dealing with dizzying levels of network change today. There’s no breathing space on the horizon. The pressure is relentless.